The Starting at Home Conference is a biennial event co-sponsored by Ohio Housing Finance Agency (OHFA) and Ohio Capital Corporation for Housing (OCCH) that brings together a variety of visionaries, from academics and philanthropists to urban planners, policymakers, advocates, developers and more. This conference hopes to create a dialogue about the role of affordable housing in building strong, vibrant and healthy communities that enable people to prosper. Segregation characterizes every metropolitan area in the U.S. and bears responsibility for our most serious social and economic problems—it corrupts our criminal justice system, exacerbates economic inequality, and produces large academic gaps between white and African American schoolchildren. We’ve taken no serious steps to desegregate neighborhoods, however, because we are hobbled by a national myth that residential segregation is de facto—the result of private discrimination or personal choices that do not violate constitutional rights. 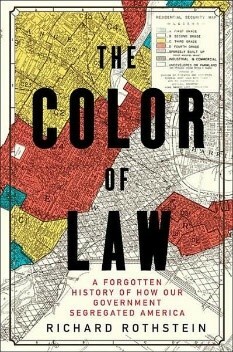 The Color of Law demonstrates, however, that residential segregation was created by racially explicit and unconstitutional government policy in the mid-twentieth century that openly subsidized whites-only suburbanization in which African Americans were prohibited from participating. Only after learning the history of this policy can we be prepared to undertake the national conversation necessary to remedy our unconstitutional racial landscape. Richard Rothstein is a Distinguished Fellow of the Economic Policy Institute, and a Senior Fellow, emeritus, at the Thurgood Marshall Institute of the NAACP Legal Defense Fund and of the Haas Institute at the University of California (Berkeley). He is the author of The Color of Law: A Forgotten History of How Our Government Segregated America. The book expands upon and provides a national perspective on his recent work that has documented the history of state-sponsored residential segregation, as in his report, 'The Making of Ferguson.' He is also the author of Grading Education: Getting Accountability Right (2008); Class and Schools: Using Social, Economic and Educational Reform to Close the Black-White Achievement Gap (2004); and The Way We Were? Myths and Realities of America’s Student Achievement (1998). Other recent books include The Charter School Dust-Up: Examining the Evidence on Enrollment and Achievement (co-authored in 2005); and All Else Equal: Are Public and Private Schools Different? (co-authored in 2003). He welcomes comments at riroth@epi.org. When you register, you can pre-order our keynote speaker’s hardcover book, The Color of Law, at the discounted price of $23.00 (list price $27.95) and pick it up when you check in at the conference. View sponsorship opportunities to help support this event by clicking here. The registration fee provides access to all plenaries, sessions, luncheons, breaks, and the networking reception. Everyone must register individually including sponsors, exhibitors and speakers. Registrations will be accepted online via credit card only. You will need a unique email address and a valid American Express, MasterCard or Visa credit card to complete the registration. Conference registration payments will not be invoiced. If you need to make any changes to your registration, please click here. Please contact occh@occhevents.org with any questions.